If you follow these tips to proper care and maintenance, your pipe can last many years. • Most importantly, use pipe cleaners as you smoke. It will help keep the pipe dry and smelling sweet. • Never leave your pipe in the sun or heat. Direct sunlight will change the color of the pipe, and the heat can change the flavor of your pipe. • If you have to stop smoking and are not going to smoke again in the next 10 or 20 minutes, empty your pipe. Never leave tobacco, smoked or unsmoked, in your pipe. It clogs the flow of air necessary to help dry the pipe and adds moisture to an already moist pipe. • When emptying your pipe, never bang it on anything except the palm of your hand. Use a pipe tool to loosen the tobacco and empty it carefully. • The last thing you should do to your pipe, after you have emptied the bowl of tobacco, is run a pipe cleaner though the stem and shank. This will clean and dry out your pipe. Don't remove your bit from the shank unless doing a major cleaning. • Rotate your pipes. 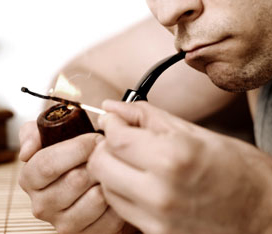 Never smoke a hot pipe; try to wait at least one to two hours before re-smoking the same pipe. • Try to keep your pipes in the open; never keep them in a closed box, drawer or bag. Pipes kept in closed containers will become smelly. Pipe racks are the best; they are open, which allows the air to flow though the pipes. Also, most racks keep the pipe in the best storage position, with the stem facing up and the bowl on the bottom. • If the pipe becomes a little smelly and not as sweet as before, try dipping your pipe cleaners in drinking alcohol (vodka or rum). Run the alcohol dipped pipe cleaner though the stem and shank until it comes out clear; then let your pipe “rest” for a couple of weeks. • If the outside of your pipe bits become dirty or start to turn color, try using toothpaste on a rag. Use it only on the pipe bit and not on the shank. Toothpaste is a mild abrasive; it will clean the bit without harming it. We offer a variety of Pipe Cleaning Accessories such as Pipe Cleaners, Tools and Reamers. We also carry many types of Tobacco Pouches that can be used to store pipes, tobacco and accessories. And we have a large selection of Pipe Stands that hold as little as 1 or as many as 6 pipes.